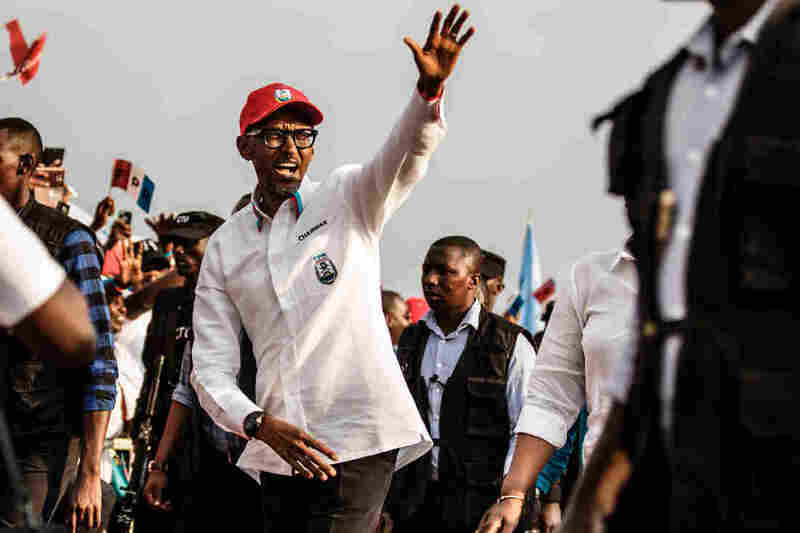 Rwanda's Kagame Has Ushered In Peace And Progress, And Crushed Dissent : Parallels Paul Kagame has led Rwanda for 17 years and won re-election Friday. Many consider him a national hero for ending a genocide. But he's ruled with an iron fist and silenced all opposition. Rwandan President Paul Kagame greets the crowd after addressing supporters at the closing rally of the presidential campaign in the capital, Kigali, this week. As music rose from the speakers, Kagame emerged from the behind the stage, a small man wearing his trademark black rim glasses. The crowd went wild — they waved; they sang; they screamed. At least there, you would be hard-pressed to find any detractors. Angelique Nakure said Kagame has built schools and hospitals and he would do even more if he wins a third term. "Kagame is the best president," Nakure said. In Rwanda, many consider 59-year-old Kagame a national hero. He's the man who, 23 years ago, rallied a beleaguered group of rebels and marched into the capital Kigali to oust the government. While the international community just watched, his troops ended a genocide that killed some 800,000 people. Kagame won 98 percent of the vote in Friday's election, with 80 percent of the votes counted, the electoral commission said. His victory was widely expected. But as he nears two decades in power, Kagame is in the midst of a mixed legacy: that of a leader who has ushered in peace, stability and progress and that of a brute with little patience for dissent. "People have a reason to fear"
Frank Habineza, a 40-year-old politician, has tried for years to run for president as the candidate for the Democratic Green Party. But he says the government — citing security concerns — had blocked him from registering his party. This was the first election in which the Green Party was recognized, and Habineza made it on the ballot. Sitting in his small office in Kigali, he says one should be very skeptical of what one hears on the streets of Rwanda. "Rwandans are afraid of their government," he says. When he tried to run for president in 2010, his deputy ended up dead and two of his colleagues ended up in jail. Fearing for his life, Habineza went into exile. "We are beaten, our people imprisoned, others exiled," he says. "So basically, when people see all that, people have a reason to fear." It's also not just political repression. Recently, Human Rights Watch issued a report that found Rwandan security services deal with petty crimes ruthlessly. The group found that one man was shot three times for allegedly stealing a cow; another was executed by the military for stealing bananas. That version of Rwanda is definitely not what you see on the surface. Under Kagame's tenure, Rwanda has made significant strides toward becoming a middle-income society. Roads are paved; streets are lit. The GDP has grown more than 1,000 percent since the genocide; life expectancy has shot up, from 28 years during the genocide to 64 years in 2015, and Rwanda has become one of the least corrupt countries on the continent. It's a place where all state employees post their supervisor's cellphone outside their office, and public officials are fired if they don't meet the stated goals in their performance contracts. "Kagame has put Rwanda on another map today," says Albert Rudatsimburwa, a political analyst and an unapologetic fan of Kagame. "When he took over, he transformed a whole defeat into a success story." Rudatsimburwa thinks Kagame is misunderstood. To him, Kagame is the last liberation leader on the continent, following in the footsteps of Yoweri Museveni in Uganda and Robert Mugabe in Zimbabwe. "Except Kagame has learned from their mistakes," Rudatsimburwa says. The political analyst is certain that Kagame doesn't plan to stay in power as long as Museveni or Mugabe, who has been in power for 37 years. But he says that Kagame also understands that Rwanda is fragile, still recovering from the kinds of tribal divisions that led to the 1994 genocide. Demanding the same kinds of freedoms that mature democracies enjoy, he says, is naive. "Those democracies are based on an accumulated wealth that makes things run anyway so that people can play political games," he says. "This is not where Africa is and certainly not Rwanda." Diane Rwigara, a 35-year-old accountant turned politician, lives in nearly the same neighborhood as the presidential palace. A tall concrete wall surrounds her house, and when this reporter arrives, she asks if she can borrow his phone. She says she can't call friends from her phone line anymore because they're afraid they'll be linked to her. "In Rwanda, you are guilty by association," she says. Rwigara tried to run for president, but she says the government first shamed her by leaking naked photos of her and then put up insurmountable procedural hurdles. For example, she had to collect signatures from supporters across the country to get on the ballot. But she says state security agents would show up beforehand and intimidate people. She says they told supporters it was treason to support her campaign. "It's very dangerous," she says. "But the truth of the matter is people are tired. People are ready for change." President Kagame declined NPR's request for an interview, but during a recent press conference he was asked directly about Rwigara's allegations. He chuckled and then issued a couched condemnation. "Let me assume what you are saying is correct," he said. "If anybody was denied their rights, it's absolutely wrong." Rwigara says she is sure, if an election were free and fair, she could be president. She wants Rwandans to be able to question government policies. She says she wants Rwandans to be able to express views on simple things like whether farmers should be able to choose what crops they plant or whether the government should have spent millions building a state-of-the-art convention center. "We deserve freedom," she says. "We're no different than any other human being. Like I said, that's just insulting to me to think that we need to be told what to say and what to do." Kagame's re-election puts him in office for a third term. In 2015, 95 percent of Rwandans voted in favor of a constitutional amendment that extended the president's term limits. Under that new constitution, Kagame can serve until 2034.